Angelic is Julius O’Riordan (better known as Judge Jules), Amanda O’Riordan (Judge Jules’s wife) and Darren Tate. This article will focus on Darren Tate though. English born Darren Tates musical background started out as a classically trained musician. His first release came with the Angelic project in 2000 and has since then worked under a few different aliases. Angelic’s It’s My Turn was released in June of 2000 with vocals by Amanda and became a huge hit and peaked at no 11 in the UK Singles Charts and stayed on the chart for 10 weeks. 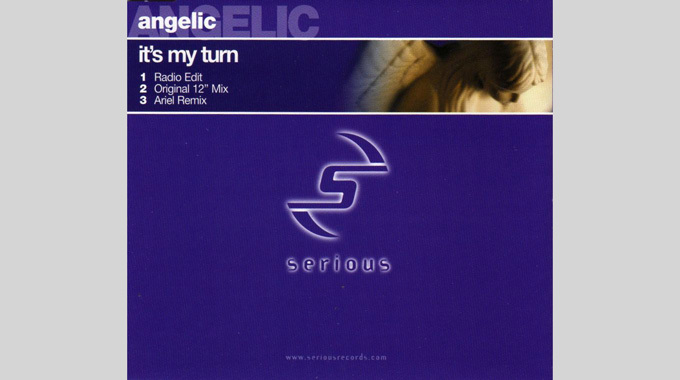 Its My Turn was built on Angelic’s remix for Sunscreem’s track called Change which was released in early 2000. It’s My Turn was re-released in 2009 with fresh remixes. After the 3 tracks, the group split up and they all went their separate ways. While in Angelic, Darren released a 3 releases under the name Orion. Eternity and New World EP was both released in 2000 wile See Me Here came the year after. The project re-emerged in 2011 with the album Electronic Witchcraft with 10 all new tracks. After Orion, Darren released one track as Citizen Caned called The Journey. If you listen closely, you can almost hear whats up next. In 2002, Darren worked under the name Jurgen Vries and the first track, The Theme became a major hit all and peaked at no 13 in the UK charts and was played by all major Djs all over the world. The track has also influented many artists over the year, for instance a new track by Filo & Peri called Sub Zero. Cosmic Gate also released an own version of The Theme in 2011. The second track from Jurgen Vries was The Opera Song (Brave New World) with singer Charlotte Church. When the track first was released, the singing was only credited to CMC when it first was released as Charlotte’s record label wouldn’t wanna be connected to the track if it flopped as it was a big change from her classical singing to pop. There were alot of speculations who sung on the track under the mysterious guise and many people guesses on Kylie Minogue or Christina Aguilera. The Opera Song peaked at no 3 in the UK singles charts in 2003. The third single from Jurgen Vries, Wilderness came out in 2003 and featured Shena on vocals, It did fairly well and peaked at no 20 in the UK Charts. The last single from Jurgen Vries was Take My Hand with Andrea Britton on vocals. The track was a cover of Dido’s track with the same name. Peaked at no 23 in the UK Charts. From 2003, Darren put all his focus on his DT8-project, later named just DT8 Project. The secnd single from DT8 was The Sun Is Shining (Down On Me) and featured singer Rob Li. The track was another chart-success and peaked at no 17 in the UK Singles Charts in 2004. Winter, with singer Andrea Britton was released in march of 2005 also became another chart-success and peaked at no 35 in the UK Singles Chart. African singer Mory Kante was featured on the single Narama released in 2006. One of my favourite DT8-tracks came out the year after. Hold Me Till The End with singer Alexta. Her moaning vocals makes the track magical. The album Perfect World was released the same year and features another stunning track by Alexta, Tomorrow Never Comes but it wasn’t released as a single. The album also got voted the most inspiring and original electronica album of the year. The last single, The Power Of One was released the same year. While releasing under aliases, Darren has also released quite a bunch under his own name. Darren Tate vs Marcella Woods – Lifted came out in 2001 and was followed by the epic track Darren Tate vs Jono Grant (of Above & Beyond-fame) – Let The Light Shine In (with singer Shirley Randall). Let The Light Shine In was first released as a double-feature with Darren Tate vs Mike Koglin – Now Is The Time in 2002 and later re-released as an own single. 2003 saw the EP’s Gracelands Episode 1 & Prayer For A God (Gracelands Episode 2) and later the same year another collaboration with Jono Grant called Nocturnal Creatures. The single-release of Darren Tate vs Mike Koglin – Now Is The Time was also released the same year. The next collaboration came with Blue Amazon vs Darren Tate – The Other Love. The original version by Blue Amazon is an old favourite of mine and the remix only makes the track better. The 2005 EP, Horizons 01 was followed in 2006 by the first feature album Horizons 01 which contained all the singles so far. The EP Elephant (Are You Ready) / Pulse came the same year and was followed by the EP Echoes / Chori Chori the year after. The EP Horizons 02 came out in 2008 and was followed in 2009 by the second artist album with the same name. The EP When The Morning Comes / Reverse The Silence came out the same year. The Midnight EP came out in 2010 along with Tokyo / Vespers. 2011 saw the release of The Eternal along with the Horizons 03 EP. In 2011, Darren started on 2 new projects, one with Boy George and Marc Vedo called Funkysober, another one with Harry Diamond called Tate & Diamond. If Darren follows the same pattern as before, we should se the new artist album Horizons 03 sometime this year. As many of these articles, I’d have to say that the best material from Darren Tate came out from 2000-2006. Darren is a brilliant producer and I love the sound that he had in the past. Can’t say that i’ve listened much to his latest material but I guess I have to give it a chance. After all, he’s achieved over 10 top 40 tracks and sold over 10.000.000 units in total. That stands for quality in my book.